Off the Ball is petty, ill-informed and fronted by two Scottish football fans who really should know better. 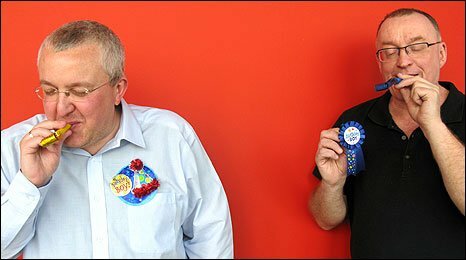 Stuart Cosgrove and Tam Cowan have endured more highs and lows than Michael Fish, but, erasing the memory of the last-minute defeat and focusing on the flukey winner, they stick on the headphones each week and make us laugh about our national game. Find out more about Stuart and Tam. 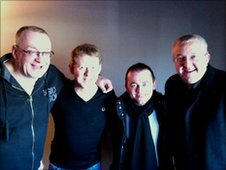 Colin McCredie and Stephen Purdon were on the show on Saturday. Yes, it was murder. Last week it was Taggart v River City as the lads were joined by Colin McCredie and Stephen Purdon to get tore into striking refs, the weather and the Christmas XI. Listen to the programme on demand or treat your ears by downloading the very best bits in the Off the Ball podcast. Film star Dougray Scott gets quizzed on his Hollywood history by Tam. In a risque clip, Tam reveals his desire to collect underwear from Elle, Gus and Archie MacPherson. Tam, in his own inimitable style, reads out a rather risque song on the charms of the women of Brechin. A caller's blagging reminiscences lead to Tam advocating breastfeeding in football grounds! 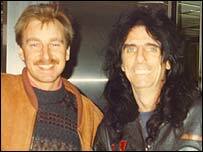 Colin Rae sent us this photo of him with hairy rock star Alice Cooper. Jeez-oh, Alice looks like Gnasher! Or Terry Hurlock?! He says: "It was taken a few years ago when I was sporting a Graeme Souness moustache, which I no longer have. In fact, I no longer have any hair! 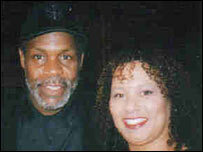 Paula sent in this snap of herself with actor Danny Glover, perhaps most famous for his role in the Lethal Weapon films. Regular e-mailer and St Johnstone fan Paula has become well-known to listeners as the 'Scary Saint' but Glover shows no signs of fear in this shot. Amanda Harrigan took this picture at a golf course where our very own Tam Cowan made an appearance. We were impressed with the distinguished look, style, glamour and charm. Oh, and Amanda scrubs up well too. Strictly speaking there are not any celebrities in this next photo. However, always looking to be charitable, the Off The Ball team thought it would be nice to let Paul Munch get his face on the show's website. It had nothing to do with the cheerleaders, honest! Paul sent this pic all the way from Australia, thus demonstrating Off The Ball's worldwide appeal. 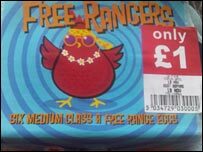 Katie Cole from Stirling saw these eggs in a supermarket. Does 50p from every box sold go to the club? Who are Stuart and Tam?